Simple 3 year financial projection template for easily preparing 3 year cash flow forecasts; 3 year ‘Cash Flow Statement’ projections; 3 year profit and loss projections; and 3 year forecast balance sheets. When you’re running a business, the last thing you want to get bogged down with; is in preparing lengthy and complicated Excel spreadsheets. SAVE TIME: Save time setting up lengthy and complicated spreadsheets with our 3 year financial projection template. AVOID EXCEL FORMULAS: Avoid complex Excel formulas. Instead enter numbers on easy to use templates. SAVE MORE TIME: Save valuable time, as the professional reports are ‘ready to go. AVOID WORRY: No need to worry if your numbers balance, as a projected balance sheet is built-in. STOP THE HEADACHES: Avoid headaches and lost time spent calculating which numbers to include on which reports. This has all been done for you. AVOID PAIN: Escape the pain of working out where and how to include VAT (Sales Tax), as these calculations are done for you. SAVE YET MORE TIME: Save time reviewing your best and worst case scenarios with the built-in sensitivity analysis tool. NEED MORE THAN 3 YEARS? Need financial projections for more than 3 years? No problem, as Cash Forecaster creates cash flow projections for periods of 12 months to 7 years. If you don’t have the time to begin from scratch. If you dread the thought of staring at a blank spreadsheet. Help is at hand and you’ve landed on the right website. Our 3 year financial projection template is ready to go. You just have to enter your company data and the reports calculate automatically. “The template is excellent – very easy to use. You can produce a professional set of forecasts very quickly.” Tim Moorhouse. Avoid complex Excel formulas. Instead enter numbers on easy to use templates…. If you’re like most people, then you probably hate Excel formulas. It’s hard enough trying to work out which numbers to put where on a spreadsheet, let alone working out which formula to use. With our 3 year financial projection template Cash Forecaster, you don’t have to go near any Excel formulas. More time will be saved when you use our Cash Forecaster template as the reports are pre-prepared. The reports are professional and include a cash flow forecast, a projected profit and loss report, a forecast Cash Flow Statement and a projected balance sheet. These reports are calculated automatically from the entries made on the easy to complete templates. A balance sheet you can report for any period from within the cash flow forecast period. How a client explained it: “You can spend your time producing accurate figures rather than trying to work out how to make the balance sheet balance with the cash flow forecast!” Tim Moorhouse. Knowing which report and how much to include is one of the headaches of preparing financial projections. With complications that include VAT (Sales Tax), customer credit terms, taking account of supplier payment terms, stock and work in progress adjustments, to mention a few. The numbers that appear on the profit and loss projection are different to those that appear on the cash flow projection. For example, the numbers to include for sales on the profit and loss projection are net of VAT. The profit and loss numbers also relate to the date the work was performed or sold. Whereas the related numbers for sales appear on the cash flow projection on the date they are received as a cash in-flow. They are also included gross of VAT. These report complications are all taken care of for you. As already mentioned, if your small business is registered for Sales Tax (VAT in the UK and Europe), this needs to be taken into account when preparing financial projections. Our 3 year financial projection template deals with every VAT eventuality you’ll need in a cash flow projection. Another time-saving feature is the sensitivity analysis tool. It’s important to stress test your projections. With Cash Forecaster, this is made really easy whereby you can quickly increase or decrease your sales and/or cost of sales with just a few key strokes. This feature saves you time by not having to re-enter your data over and again. Banks and investors often want to know your best case or worst case scenarios. Our simple financial projections template makes the task of your what-if scenarios quick and easy. You can try increasing or decreasing your sales, whilst keeping your costs of sales the same. 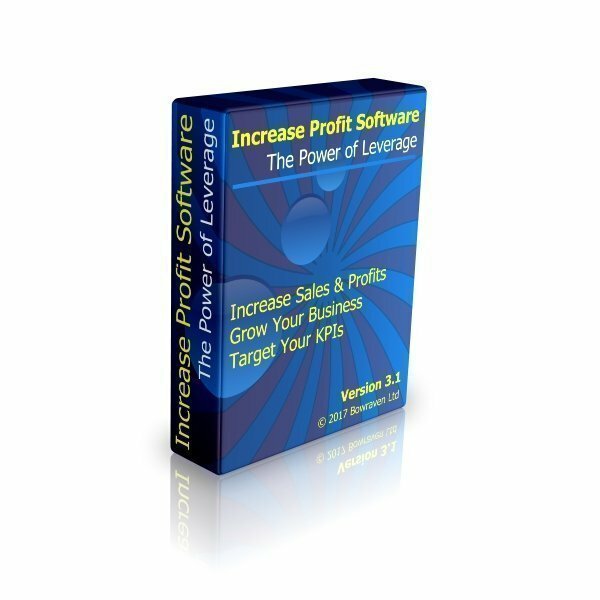 Alternatively, increase or decrease your cost of sales and leave sales the same. Finally, you can adjust both sales and cost of sales both up and/or down to provide any number of best and worst case scenarios for your financial projection. We’ve discussed mostly about 3 year financial projections on this page. However, Cash Forecaster creates financial projections from 12 months to 7 years. All you need to do is to enter your data for the number of years you require. Everyone benefits when our Cash Forecaster software is upgraded with features that other customers have requested. Recently a client was recommended to use our software by Lloyds Bank Plc. This customer asked for a specific report, so we upgraded Cash Forecaster free of charge, as it would benefit future customers too. This is a key commitments to our customers. So if you’d like us to add a new feature that will help you prepare cash flow forecasts for your small business, we will include it free of charge. The only caveats are: the feature required is possible to do; and we feel that it will benefit other clients too. This offer is a win-win scenario for you and for us. You receive a free upgrade, whilst we can offer the new feature to future customers. For this feature rich 3 year financial projection template, all you pay is a small $127 fee. Month by month forecast reports for 12 months; 24 months; 3 years; 5 years; 6 years and 7 years. 20 product/sales lines with associated cost of sales lines. Accruals and prepayment feature to easily adjust your startup forecasts to tie in with payment timings and what’s charged to the profit and loss. Ten loan or hire purchase accounts. These include many great functions and features; including: Interest rate; Loan term; Final lump payment; Set your own payment amount; Loan repayment holidays; Interest charged to the loan or to the bank; plus more. Capital expenditure and fixed assets. Asset depreciation rates including automatic calculations. Stock and work in progress feature. Factoring or Invoice discounting feature. If your company factors/invoice discounts its invoices or is looking to see how this affects business cash flows, this feature is included. Other debtors and other creditor facility. Opening balances facility – easily enter your opening trial balance or closing balance sheet. International currency symbol on all reports – £, $ and € (or any other currency). VAT, Sales Tax and GST terms – Cash Forecaster software does all the necessary calculations for you. Automatic overdraft interest or deposit interest calculations. Flexible customer payment terms – With up to 12 months credit terms. Prepaid income with up to 24 months advance payments. Flexible supplier payment terms – Payment terms include cash through to 12 month payment terms. Payroll taxes and wages deductions. Company/Corporation tax calculator with great features, including adjusting the profit for tax purposes. Sensitivity analysis tool to speedily trial various scenarios. Owner dividends or drawings/capital introduced or director/partner loans. Flexible headings that can be changed to suit your business. Factoring or invoice discounting report. Backup report which provides a detailed breakdown to support the forecast profit and loss and balance sheets. Monthly reports for profit and loss and balance sheet. Choose whatever period you like with comparatives of your choice too. Our 30-Day Promise To You: If for whatever reason you buy our cash flow forecasting software and don’t like it, we will refund all your money; no questions asked. Also, please notify us immediately of a feature you’d like included when you purchase Cash Forecaster software, and we’ll extend this guarantee to the point we deliver on including your requested feature. If we are not able to add the feature you require, for whatever reason, you will receive your money back. And remember, adding a feature in this way, is completely free of charge too. “We can recommend the cash flow forecaster as being a very simple programme to use, producing professional-looking reports, very reasonably priced and saved us many hours of work compiling our own initial spreadsheet. The after-sales service was also extremely efficient.”Jane Heard Associates. “Works a treat, a friend entered my data into the Sage Forecasting program to see if there would be any differences in outcome. Of course it did not!” Matt, ERAMA Ltd.
Once you’ve completed your purchase after you’ve checked out, you’ll be redirected to a download page. There will be a download link on that page where you can download Cash Forecaster straight to your computer. You’ll also receive an order confirmation email, which will contain a link to the software download too. So if you’re not at your computer when you buy Cash Forecaster and you’re not ready to download the cash flow forecasting software right away, you’ll have an email to link to your download afterwards. The link to your download will remain active for 30 days after your purchase. This gives you plenty of time to download your product. Cash Forecaster Excel template software. The 3 year cash flow projection template is Excel-based software. You will need to have Microsoft Excel installed on your computer, in order run the software. But, you don’t need to have expert knowledge of Excel or Spreadsheets in order to use the program, as it is easy to use and fully explained in the user manual that accompanies the software.